This is a Sandbox project. The content in this article is unsupported, and therefore may be out of date or not in a working state. That said, we still think it was awesome enough to include here. Enjoy! OctoBot is a chat bot that lets you manage your GitHub repos and issues from a chat window. This project is written in C# using the Bot Framework, LUIS.ai, and Octokit.NET. Type "login" to begin. Please note that the demo will use your real GitHub account, and any changes you make are real. You can see a demo of some of these interactions below, or try it for yourself in the chat window above. The bot can understand long sentences, short commands, and it remembers the last repo and issue you mentioned, so the conversation flows naturally. Responses also include clickable links you can use to view detailed information on the GitHub website. Setting this bot up for your own use is a bit tricky as there many parts. However, if you follow this guide closely, and in the order specified, you should be able to get this running yourself. 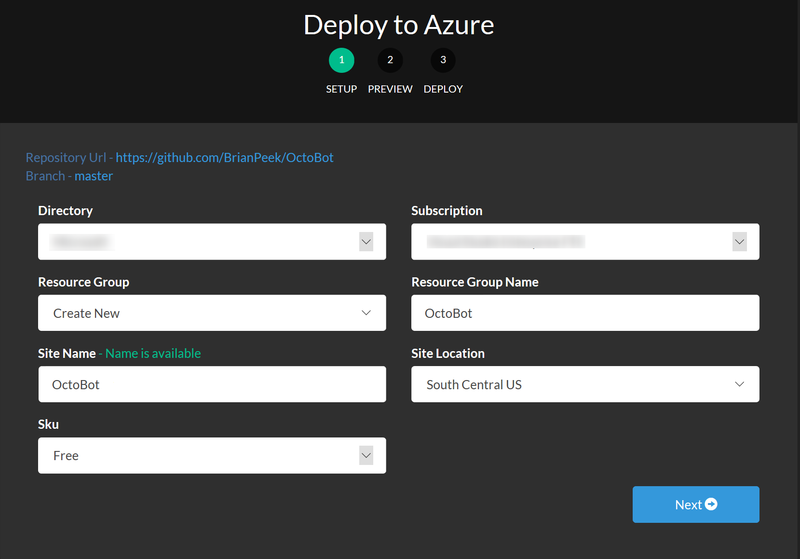 Click the Deploy to Azure link here or the button above. Enter the information for your Azure subscription, such as the resource group, location, etc. and give your site a unique Site Name. This site name will become part of the URL. Click Next and then Deploy. When complete, opy down the URL to your web application, which will be https://<sitename>.azurewebsites.net . When the application is deployed, the GitHub repo above will be setup in the App Service as the deployment source. We'll come back to the portal later to enter some keys that you will generate below. Browse to the Bot Framework portal and register a new bot logging in and/or creating an account if necessary. Enter a name and handle in the Bot profile section. 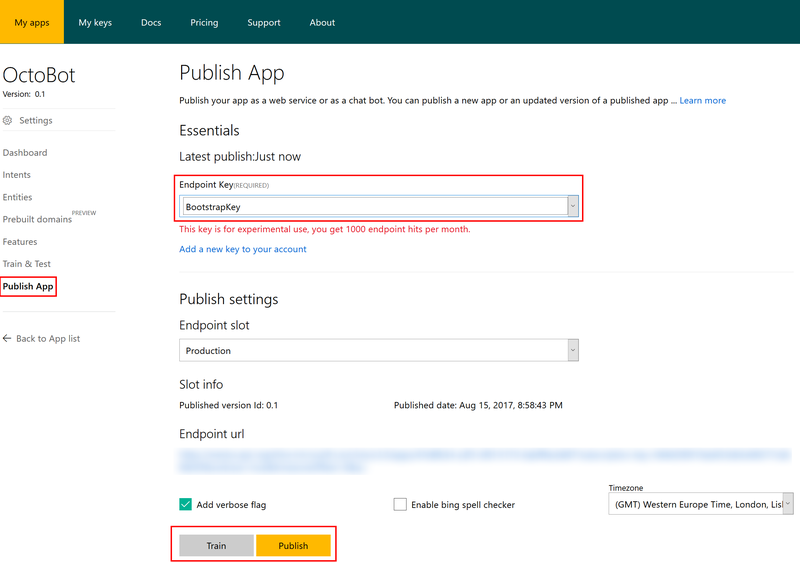 Enter the messaging endpoint -- assuming you deployed your app to the default location using the link above, this will take the form of https://<sitename>.azurewebsites.net/api/messages . Click the Create Microsoft App ID and password button and login if requested. Note: The App ID can be viewed later on from the Bot Framework portal, however the password is only displayed this one time. If you lose it, you will have to generate a new password. Click the Finish and go back to Bot Framework button. Browse to the OAuth applications section of your profile on GitHub. Click the Register a new application button at the top right corner of the page. After the app is created, you will be presented wtih a Client ID and Client Secret. Copy these somewhere safe as you'll need them later. If you lose them, you can always browse back to the link above and view your application and change its configuration. Download this file or clone the whole GitHubBot repo. Sign into the LUIS.ai website, creating an account if necessary. Click the My apps tab. Click the Import App button. Click the Browse... button and select the GitHubBot.json file. Optionally, give the app a new name, otherwise it will use the default name of GitHubBot from the model you just uploaded. Click the My keys tab and copy the Programmatic API Key which is good for 1000 endpoint hits per month. This key is just for testing, and you can setup a production key later. These keys are always accessible from the LUIS.ai site later on. Click the My apps tab and select the bot you just created from the list. Click the Publish app selection in the left navbar. 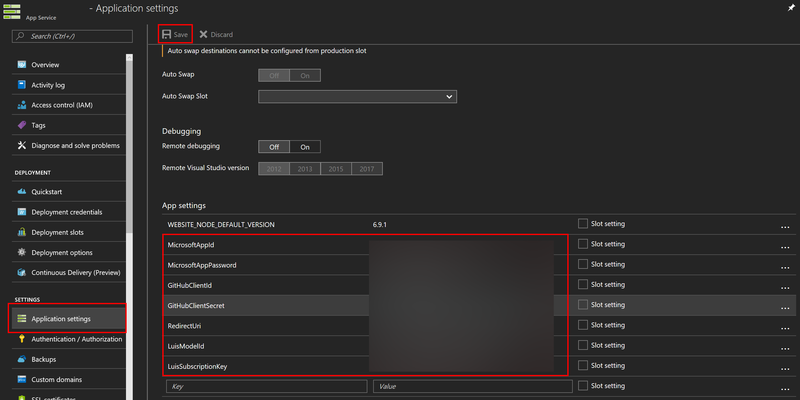 Select the default Endpoint Key in the dropdown box (or one you purchased). When training is complete, click the Publish button. Browse back to the Azure portal and login. Open the App Service that you deployed above. Click the Application settings entry in the Settings section in the left panel. Type help at the bot to get more information, or login to log into GitHub with the bot. OctoKit.NET is a library that wraps the GitHub REST API for .NET developers. This handles OAuth in addition to all of the GitHub calls we need. To use this in your own projects, just search for OctoKit in the NuGet package manager and install. The API itself is quite simple. 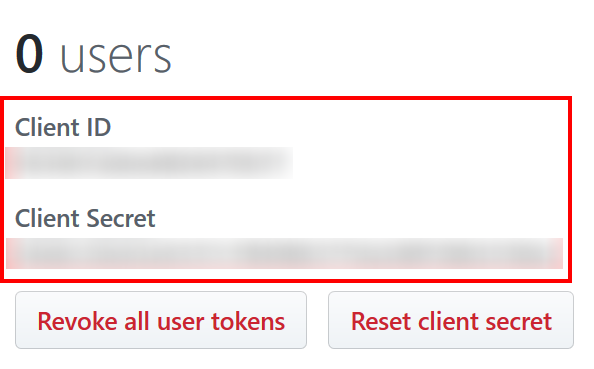 Once you complete the OAuth procedure on behalf of the user, you'll be handed a token that is used for each subsequent query (or, you can use the library anonymously to query public GitHub information). The library handles much more than repos and issues, but that's all this demo is currently using. OAuth is required to authenticate a user against the GitHub API. OctoKit.NET handles most of the messiness of OAuth, but we still need to do a few things ourselves, especially as it relates to the Bot Framework. When the OAuth process is initiated, OctoKit.NET calls a specific endpoint at GitHub with some state data we pass along. Part of this data is a serialized ConversationReference object. The OAuth procedure will hand this serialized state back to us after the user logs in, and we then use this to spin the conversation back up with the user and continue. This makes the login procedure seamless. It contains 9 intents which map to the "commands" the chat bot can handle. Check the Intents tab in the left navbar to see them all and how they were trained. It contains several custom entities that make parsing the query possible. These include the ScopeType (private or public for repositories), and RepoName. The model also uses two prebuilt entities: datetimeV2 and number. DatetimeV2 is interesting in that a user can say something like "What are my new issues since last Friday" and LUIS will convert "last Friday" into the actual dateime for "last Friday" so you don't need to do the math yourself. There are a lot more prebuilt entties -- see the docs for more information. The model contains two phrase lists to help LUIS understand GitHub-specific terms like repossitory, gist, pull request, etc. You can find those in the Features tab in the left navbar. LuisDialog is the class used by the Bot Framework to work with LUIS results. Methods in this class are tagged with the LuisIntent attribute and the intent it maps to. So, when LUIS determines the user is requesting the CloseIssue intent, for example, the CloseIssue method in this class is tagged with that intent and will be call automatically through the Bot Framework. The LUIS service is mapped to our class in the first few lines of the Message handler in MessageController.cs. Here are links to the docs for many of the items discussed above. Play around with the project and feel free to leave comments on the article, open issues in the repo, or submit pull requests with fixes and new features.